Another beautiful basket! 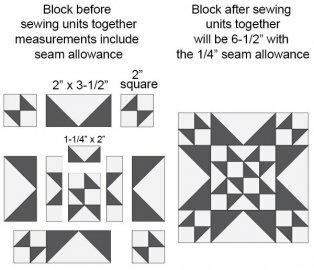 This block is a traditional applique design, however, use the method you are most comfortable with! 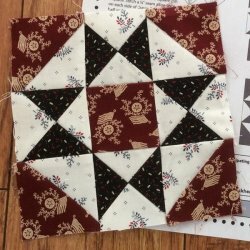 Jan Patek has provided a video tutorial for this block! Click here to view the video. This is the link to Basket and Flower! Enjoy! Have you noticed the number of half square triangles used in these quilts! If you have not already tried the half square triangle paper, you need to do yourself the favor! The paper makes the triangle so much easier and accurate! This is the link to Ohio Star Variation! Enjoy! This week’s block is Basket of Triangles from Betsy Chutchian. The main component of this block is half square triangles. You could use 1” triangle paper, but Betsy suggests cutting 2” squares then trimming each triangle unit to 1-1/2” And again starch your fabrics! These are small pieces and it really does help to sew accurate seams! The block instructions are on Betsy’s blog here. Block Link Here. You might want to check out Jo Morton's blog here. Each of the blogs links over to the Block of the week so you will always be able to find the instructions. Have you chosen your favorite design? Enjoy! This is not our first jump into curves! Last week was the practice run, now we are ready for Block 7. If this is your first time trying these units, not to worry- they’re pretty simple. Lisa Bongean has offered an alternate to block 7, as did Jo Morton. There are already many “flowers” in this basket pattern. Enjoy! Carrie Nelson's pattern, Sunflower for Week #6 adds a little applique to the bouquet. The center circle has been appliqued. If you haven't yet taken Susan Albaugh's "Sweet Beginnings" class to learn this technique, Betsy Chutchian describes her technique HERE. Another alternative is to replace the center with a snowball square. There are so many ways to approach this week's block! Enjoy your sunny week and your sunny block! 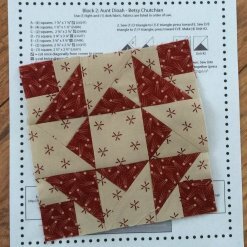 Moda Blockhead block for Week #5 is Coronation Block by Lisa Bongean. There are some absolutely gorgeous versions of the first 4 blocks on Instagram. The links are below. You can catch up and make previous blocks if you like, or join right in and start with today's post. No rules, no pressure! For this week’s block, it’s time to UP YOUR GAME! 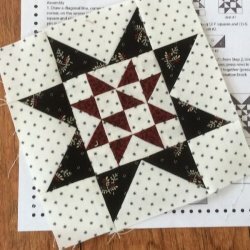 Hope you are all starching your fabric, because it will make this week’s block a little easier. If you have never followed Lisa Bongean's blog, this week, you will want to head on over to it for the wonderful step-by-step instructions with photos that she gives. You got this one! We are available in the store for if you need help. Download the instructions and the revised cutting instructions. Go to the end of her post, before the viewer comments. This is Betsy's Block 5. The 2 strong darks play beautifully together against her light background! by Jan Patek and you can download the corrected pattern with instructions by clicking here. This is the first applique block. 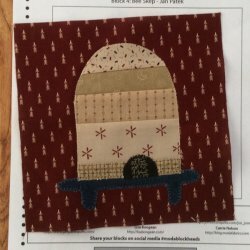 Jan noted on her blog to match the color of the thread to the appliqué, not the background - Unless you take Betsy's approach, and love that she used wool for the bottom of the Beeskep stand! There are many ways to approach this applique. Including NOT using an applique block, but following Lisa Bongean's replacement block. Happy Spring! Spring arrived on Monday! Can't you feel the energy! Block 3 is from Jo Morton. We have so many beautiful Jo Morton fabrics in the store, the newest is Reflections, with over 30 assorted bolts in stock, plus the reproduction wall, you are sure to find your Blockhead fabric collection. This text links to Jo's Blog where you can view her block samples and click to the pattern. 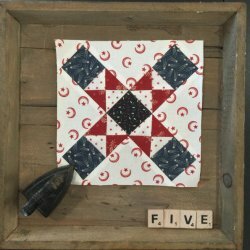 This is Betsy's Four X Block with the Liberty Gatherings Fabric. 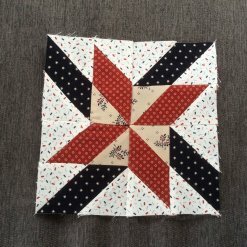 Betsy chose 3 fabrics for this star block. You can use 2 or 3 fabrics for a totally different look! If you haven't started, these are easy-to-follow patterns, so you will be able to catch up quickly! Have you finished Block 1? Be sure go click over to the design blogs to see their finished Block 1's! Betsy Smyth is the designer for Round Bobbin following along with the BOW blocks. Her designs will be posted here weekly, so check back to see the beautiful block arrangement she came up with! Betsy S's Aunt Dinah block is another winner! 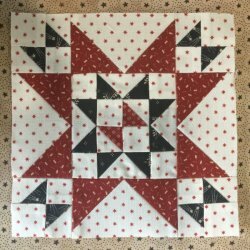 Betsy Chutchian posted her block today, you can click here, http://betsysbestquiltsandmore.blogspot.com/ for her full posting! She tells us that she is starching each of the fabric before cutting the pieces. Good decision, these pieces are small and keeps them from stretching out of shape. Betsy C. is also saving her tiny scraps and making really tiny blocks. They are so cute and present an additional challenge! Will YOU create mini blocks too? Block patterns are free and published weekly on each of the designer's blogs. The blocks are 6" blocks so it is no big commitment,... I'm in! This is doable even on my busy schedule! This is Betsy Smyth's Block 1. She is using the Liberty Gatherings line of fabric. Betsy is going with a red, white, and blue Patriotic theme. Yardage? Carrie Nelson suggests that "if you know you’re going to want to use a single collection – start with at least 24 fat quarters and 3 to 4 yards of background." This is going to be a fun! We look forward to seeing YOUR block!